Northbank Home Inspection is here to partner with real estate agents, brokers and the homebuyer for an important step in the selling and buying process. Above all, we provide fair and objective reporting. We believe the purpose of a certified home inspection should be to report the actual condition of a home with the goal providing accurate information. Clear communication is essential. We strive for clarity in our reports, which are made easily accessible online, giving you and your client access to their report as quickly as possible. At Northbank Home Inspection, we understand time is an important factor when it comes to a sale, especially in a growing community like Clark County. We work within your schedule and provide same day e-reports that are user-friendly, with a modern design. Our home inspection reports are organized and clear to reduce any confusion and possible back and forth for clarification. However, we are always available to answer any additional questions — a call, text, or email will get an immediate response. All reports include a clear, succinct summary that touches on key points of the inspection so your client can focus on what’s important. 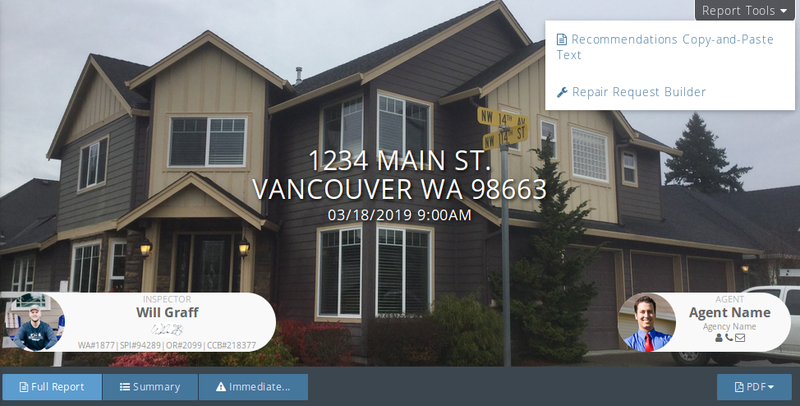 The full detailed report will give your clients clear photos and descriptive comments for empirical evidence of the operation and status of the home’s components to help them make safe and smart decisions about a home. Our reports will save you time and take the headache out of traditional home inspection reports. When you refer Northbank to your client, you can be assured your standards of professionalism and quality will be mirrored by our work. Not only is Northbank licensed to perform home inspections by Washington state, we are also certified professional inspectors by the International Association of Certified Home Inspectors. In addition to home inspection, we offer mold and radon testing. We are passionate about the Vancouver, WA community where we live and work. We look forward to partnering with you.